Singer/actor James Romick was born in Warren, Ohio, earned his Bachelor of Music Degree from the Dana School of Music at Youngstown State University. While attending college, he appeared in numerous university productions as well as on stage at the Youngstown Playhouse. 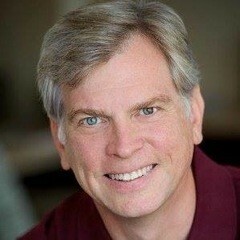 Some of the many roles Jim has taken on include that of Jesus in Godspell; Curley, Will Parker and Judge Fry in Oklahoma, Edward Rutledge and Thomas Jefferson in 1776; Lancelot in Camelot; Lt. Cable in South Pacific; El Gallo in The Fantasticks and Perchik in Fiddler on the Roof. He has performed in various productions for regional, stock and dinner theatres. "Hands down I would pick James Romick in Phantom of the Opera [as the best understudy on Broadway] ... his performance of the Phantom is just so moving ... that and he has one of the most amazing voices on Broadway. Both in quality and range are perfect and amazing!" Today, James Romick is busy putting his rich, clear, full-bodied voice to use as the voice used by many of today's authors in audible books. You will also hear his voice in countless TV commercials as the voice behind the products. Everything from banks to aspirin. I recently had the pleasure of hearing his smooth resonant voice reading my favorite author Tony Piazza's book Anything Short of Murder�on Audible.com. I must admit it was this enjoyable experience that piqued my interest in interviewing this fine actor and storyteller. COOKIE:�James, you use your voice to tell a story with impact and as a recording tool to depict live action and emotion as you carry out the precision writing of the author, especially when using phrases and accents. In your recent audio book by Tony Piazza,�Anything Short of Murder�you had to come up with numerous voices and accents. Is this a challenge to come up with all these accents, or do they come naturally to you as an actor? JAMES:�I'm originally from Northeastern Ohio, just outside of Youngstown. That part of the country has, what they call in the voiceover world, a Neutral American accent. Some regionalisms (we say�"pop"�instead of "soda"), but no real twangs or drawls to speak of. I remember when I was a kid, we'd gone on vacation for a couple of weeks down South, and I'd picked up a kind generic Southern accent that took days to get rid of when we'd returned home. My friends actually laughed at me for�"talkin' funny." I've also been a singer all my life and I went to college as voice major, so I'm classically trained. I was required to sing in French, German, Italian and Latin as well as English. There's a certain�"musicality"�to accents. I think that my Operatic vocal training and musical ear lend themselves to at least being able to mimic generic regional accents. Then there are more specific regionalisms. For instance, there's Texas Southern which is slightly different than Georgia Southern which is different than Virginia Southern. Just as there are dozens of different British dialects. But Mrs. and Mr. Middle America may only recognize Cultured British, Cockney, and possibly Liverpool. And those, most of the time, are satisfactory for the "flavor"�of a British character. COOKIE:�James, you have played so many animated roles on stage, roles that call for a lot of body action, everything from super heroes to musical Phantoms. Did you find it difficult to make this crossover to Voice only, without the body action to go with it? JAMES:�One of the biggest misconceptions about voice acting, even among voiceover artists, is that we just sit or stand in front of a microphone and talk. Physicalizing the action as I'm talking actually helps propel the action or mood. If you watch YouTube clips of, say, Seth McFarland who does various voices for The Family Guy or Nancy Cartwright or Hank Azaria of The Simpsons, they're flailing all over the place. Of course, you have keep your mouth close to the mic and not rustle your clothing because it'll get picked up. The mics are very sensitive. But that is part of the technique for voice acting. I mean, saying a line like, "And it smelled like rotten eggs," you kind of want to automatically wrinkle up your nose. It's a small physical thing, but it subtly changes your voice from a dull delivery to something most people can relate to, even if they're just listening. It really does make a difference rather than just flatly reading those words. COOKIE:�Speaking of using only your voice. I was surprised to discover that yours is the voice behind some of the most popular and familiar TV commercials. How did that come about and I'm sure that's something you will be doing more of in the future. JAMES:�I certainly hope so. And so does my agent. My main thrust in pursuing voiceovers is in the commercial field because that's where the big bucks are. It's funny. Every voice artist wants to do audiobooks. But for the time and effort involved, it's one of the least lucrative aspects of the business. There is an upper echelon of voice artists that actually make a very decent living from doing audiobooks and that reputation is made over time. I'd like to join that club someday. COOKIE:�Audio engineering is another of your talents. You studied this at the Institute of Audio Research in New York City and today have your own in-home recording studio. Please tell us about your set up and do you use it often in your work? JAMES:�When I went to audio engineering school at ARI, we were still working with magnetic tape on 16 track reel-to-reel machines and editing with razor blades. MIDI and digital recording was in its infancy. But I learned the fundamentals. Digital recording is sooooo much easier. And using an intuitive DAW (Digital Audio Workstation), which is the recording software, with processing effects plugins is a relatively inexpensive alternative to what it was years ago with tape machines and separate pieces of effects hardware that you had to pipe the sound through. Decent sounding microphones and computer interfaces are relatively inexpensive as well. The most expensive and extensive investment for home recording now-a-days is in creating a decent recording space or booth. I'm also a pretty good carpenter and woodworker, so I drew up my own plans and, with some advice and help from friends in the VO business, built my own modest sound booth. That and some good, basic and relatively inexpensive equipment has served me pretty well. COOKIE:�Among your many talents, you are an expert woodworker and wood turner. You created a unique and beautiful one of a kind gift for Howard McGillin, made up of 2,544 pieces. Please tell us more about this incredible gift called the Phantom Urn. JAMES:�Howard played the Phantom on and off for the better part of 10 years. I was his understudy that whole time. I would occasionally bring my pieces into the theatre to show off and Howard always admired them. When he decided to leave the show, I wanted to offer him something as a lasting memento in appreciation of his achievement of 2544 performances as the Phantom and letting me fill in for him when he wasn't able to do the show. So, with much head scratching and planning, I created the Phantom Urn as a parting gift. It is 12 inches around and 19 inches tall, made of Maple, Walnut, Ebony, Holly and a rainbow of colored veneers. Actually, it's made of 2545 pieces. There's an extra unseen piece in the base. Howard lost his voice during one show and only did the first act. I replaced him and finished the show. I told him that that piece represents my second act. COOKIE:�When you joined the New York cast of The Phantom of the Opera as a "swing" understudy you performed the roles of The Phantom, Raoul, Andre, Firmin and the rest of the male ensemble. What exactly is a "swing" understudy? It sounds like an incredibly demanding job. JAMES:�For most straight plays, there's what's called a�"stand-by"�- basically an understudy for a lead character, most often a star, for when that actor is sick or unavailable. And they're�"on call"�at a moment's notice. More often than not, they show up at the theatre, check to see if everything is ok, and leave. And they get paid whether they perform or not that night. Or they have to be in the vicinity with cell phone on hand to get the call at any time to go on. I covered nearly all of the men in the show, I basically understudied everybody. So, I had to be at the theatre for all 8 performances, 6 days a week as a�"just in case"�if someone got sick and couldn't go on. Everyone has what's called a�"track"�in the show, often playing different parts, and I had to learn each man's�"track"�in the show. Oftentimes there were 2 or 3 men out for the same performance, so I would have to do a cut-n-paste job to fill in the missing pieces. Some minor things just got cut from the show, but the audience never knew the difference. The other part of the job was to replace guys as they went on vacation or had personal days to go to weddings, graduations and such. More often than not, I wouldn't know what I was doing on any given night until I got to the theatre. Then there were the quiet times when I would just sit in my dressing room and read or design my wood pieces on my laptop. COOKIE:�With all the talents you possess, is it possible to have a favorite? If so, please share it with us. JAMES:�Singing gives me my greatest joy. It's like working out at the gym, it fills my system with endorphins. I've always got tunes running through my head and I'm humming all the time. Drives people nuts sometimes. Performing on stage is something I've been doing my entire adult life. I'm comfortable there and its home to me. Then there's my wood shop in my garage. I enjoy working with my hands and creating pieces out of wood. I'm also a general all around handy man and I'm constantly working on home improvement projects. COOKIE:�As one of your many fans, I must tell you James, how I so enjoyed your reading of Tony Piazza's�"Tom Logan"�mystery,�Anything Short of Murder. So it is with great anticipation that I look forward to your latest work with Tony in the�"Tom Logan"�thriller, Murder Amongst Angels. I'm excited to announce that the newest of�"Tom Logan"�mysteries has just been released,�Murder Is Such Sweet Revenge�... hoping you will be the voice for my favorite gumshoe. Please share with us what it was like to be the voice for�"Tom Logan"�and his unique cast of complicated characters. JAMES:�When Tony offered me the first book,�Anything Short of Murder, I think what cinched it was the Irish accent I gave to the character of Red. What's interesting in�A Murder Amongst Angels�is that he wrote in one description of Red that his accent got thicker, so I followed suit and laid it on a little more. Red also appears more regularly in it, as well as the introduction of his Irish lass wife. He's a fun character to play around with. Tony describes his characters very well and gives clues as to who they are and where they come from, so finding distinctive voices, accents and mannerisms for them are all there in the text. So I just think of friends or people I know and plug them in. For instance, I've modeled the voice of Red around an imitation of Barry Fitzgerald. I don't even think I've told Tony that yet. For one gangster in the first book, Tony wanted a Brooklyn accent. I went straight to Mel Blanc. He modeled Bugs Bunny around a Brooklyn/Bronx cab driver accent. So. I gave him that, but with an edge to it. I don't think I told Tony that either. Tom Logan is just me, a problem solver with a Type-A personality. COOKIE:�Thank you so much James for the interview and for sharing some of your busy day with us. Is there anything coming up in your multi-talented career that you would like to share with us at this time? JAMES:�Another friend of mine who is a voice artist and wants to start producing audiobooks as well. She's commissioned me to design and build a home studio recording booth for her so she can get cracking. In the meantime, I am enjoying listening to other audiobook narrators and studying their styles and techniques to push me to keep improving.